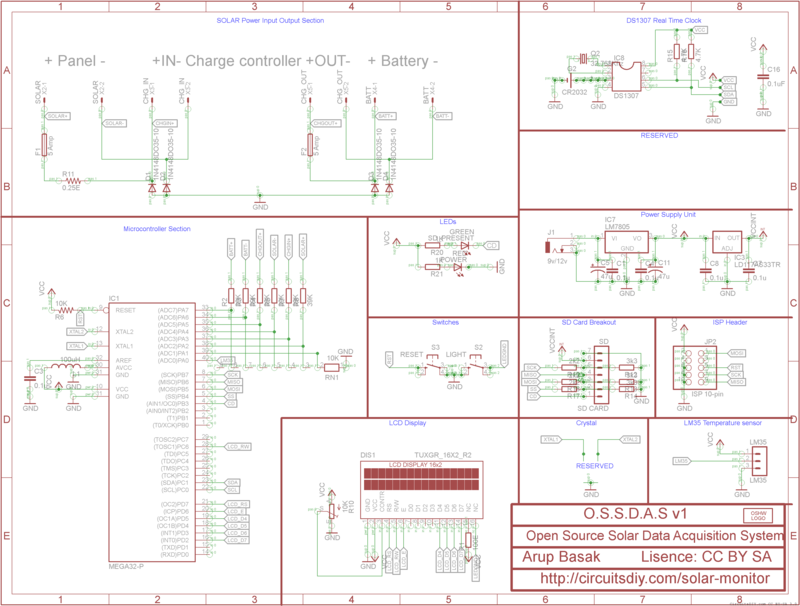 O.S.S.D.A.S v1 stands for Open Source Solar Data Acquisition System. I have been working on this project since last few months. The picture above is the not the first prototype, but the first working prototype that looks like quite complete. There will be further revisions to the hardware and software for best efficiency and accurate results. Moreover, the recorded digital data should be rich enough to reflect the real world data’s mirror. Above all this project is and will be an open source one. Anyone should be able to build it without violating any copyrights. Logs everything into attached SD card for data analysis in PC. A typical 1GB SD card can store years of data. Data is recorded in frequency of few seconds. Enough to plot a graph to analyze performance of short periods of ten minutes too. 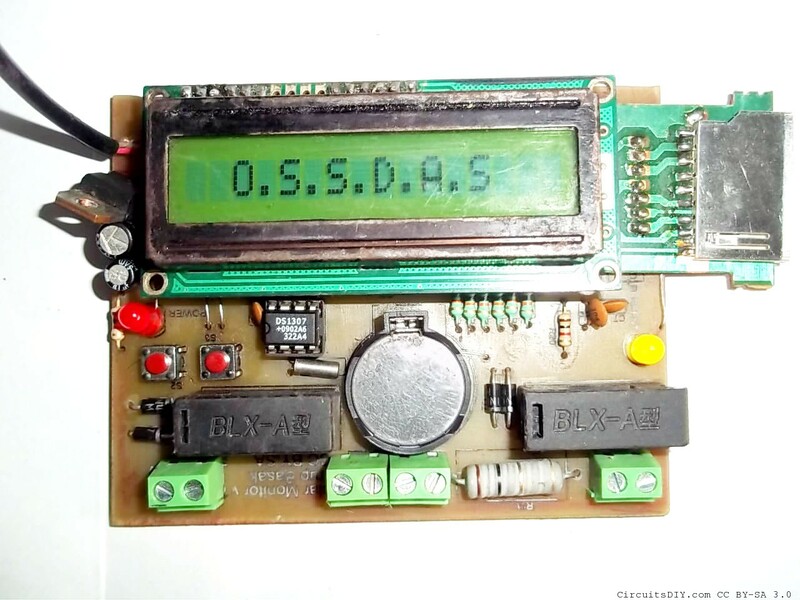 Can work without the LCD and still record information to the SD card and vice versa. Since the project isn’t finalized yet and I’ve no releasable software package or firmware. I’m publishing the design files for this hardware revision as this same hardware will remain there for a quite long period. CSA(Current Sense Amplifier) for current measurement to be able to measure small currents at good resolution. Still using no SMD components. Current design includes single SMD component that’s a L1117-3.3 regulator for providing 3.3V to the SD card. 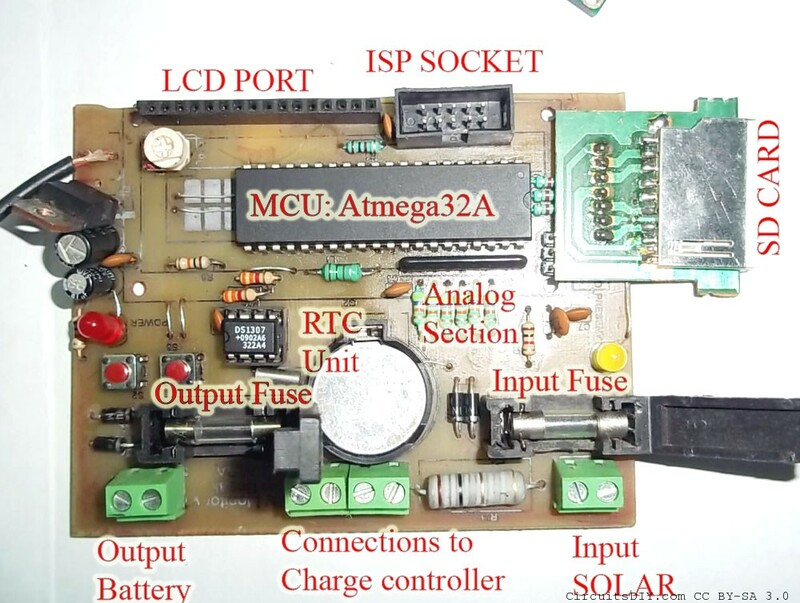 Integration of a charge controller hardware inside the PCB itself. For this I think the 80×100 sizelimit of eagle maybe an problem but probably SMD parts would be the only way then. I’m not releasing any software right now, but will so that soon once I get to a conclusion of the software. Just a thought. Maybe you should release the software in progress in another thread so that all of us can have a look at it and come up with better ideas for the same work. Will do that soon. Probably on 28’th. Thanks. Hi Pranav. I’ve published the new revisions to the hardware. Software is full messed up and needs proper reforming into structures before I can publish. Hey Arup, I was actually working on a similiar project i am making multipurpose alarm clock with the atmega32 and a similiar 16×2 LCD. Even i Used the Peter Fleury LCD library. The thing is i need a menu system. Any idea on a where/how to get started with the menu system?